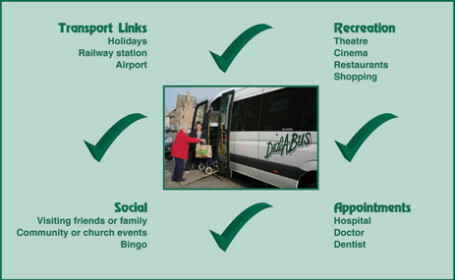 Dial-A-Ride provides a door-through-door transport service for people with limited mobility who are unable to use ordinary buses and/or suffering a degree of social exclusion due to geographical remoteness or other factors. The service operates seven days a week including evenings, subject to availability. It is advisable to book in advance, but you can try for bookings on the same day or day ahead although the availability of these bookings is subject to demand. Our vehicles are specially adapted to carry combinations of wheelchair users and other passengers safely and comfortably. Your driver will also assist you - it is part of the service - so please do not offer a tip. Do I need to be registered with Dial-A-Ride? Yes. Complete the online form on our Registration page. Passengers must be resident in Edinburgh or the Lothians and journeys are usually undertaken to places within Lothian. Can I travel outwith the Lothians? A special tariff is applied for journeys to destinations outwith the Lothian area. Prices will be quoted on request.